How do I set annotations on a facing page? It's common to set an old play (e.g. Shakespeare) with annotations on the left page and reference information on the right. I don't want to do this for a play, but I would like to set a document with annotations on one page and text on the facing page. 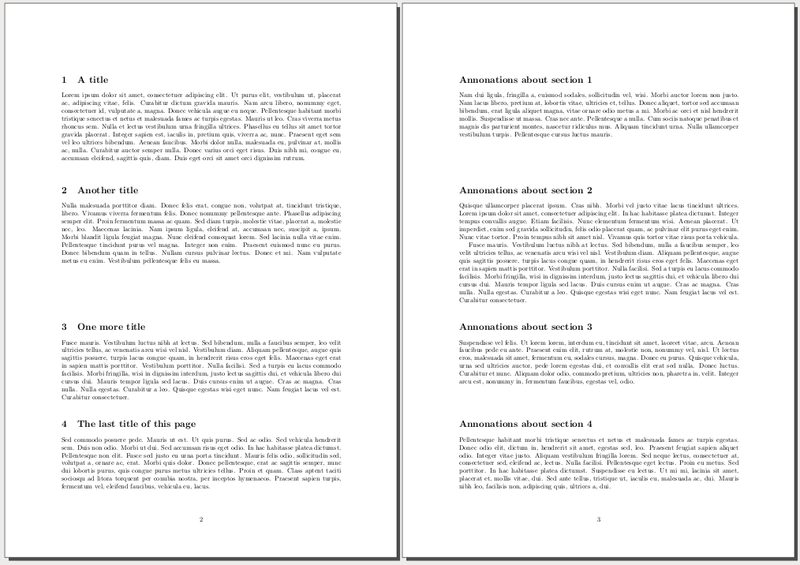 The catch is that I want to ensure that the annotations have parallel section spacing, because the length of the annotation may be longer or shorter than the corresponding section in the document, and I don't really want to make it so that you have to switch back and forth between documents. Does anyone know of a package that can do this, or an alternate way to achieve the objective of lining up the document and annotations? There are some packages in CTAN to have parallel texts, usually in columns. You can see the complete list in www.ctan.org/topic/parallel. Here's another possibility that uses the flowfram package. 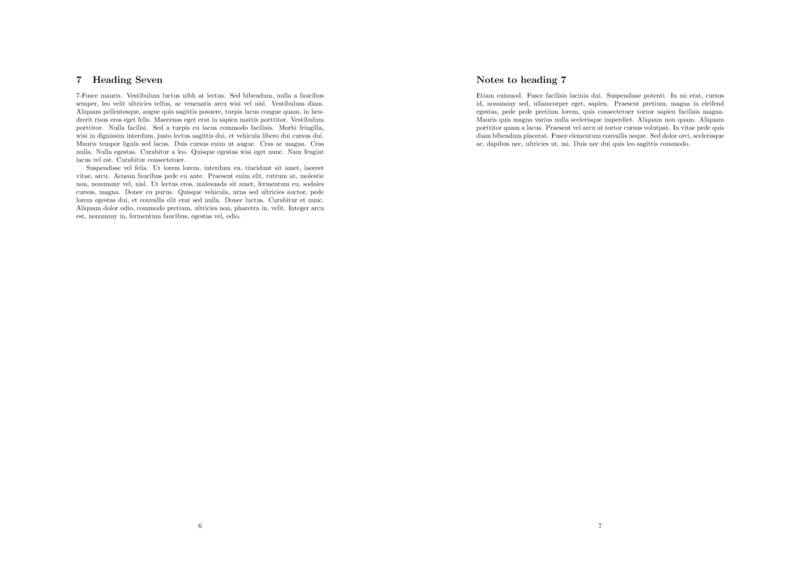 It calculates whether there's enough room on the page so you don't need to manually insert page breaks. % Does it fit the page? There is however a problem that page breaks should not happen within the multicols environment. I tried to make page breaks preferably occur before a pair text+annotation, and indeed it works here in the example. But it will probably fail easily in general I guess. Or, a better way would be to put each multicols within a minipage. Some bit of testing with real-life source would be necessary here. So we have two tex files, I called the first parallelin.tex and the second parallelout.tex. One does pdftex on the first one. 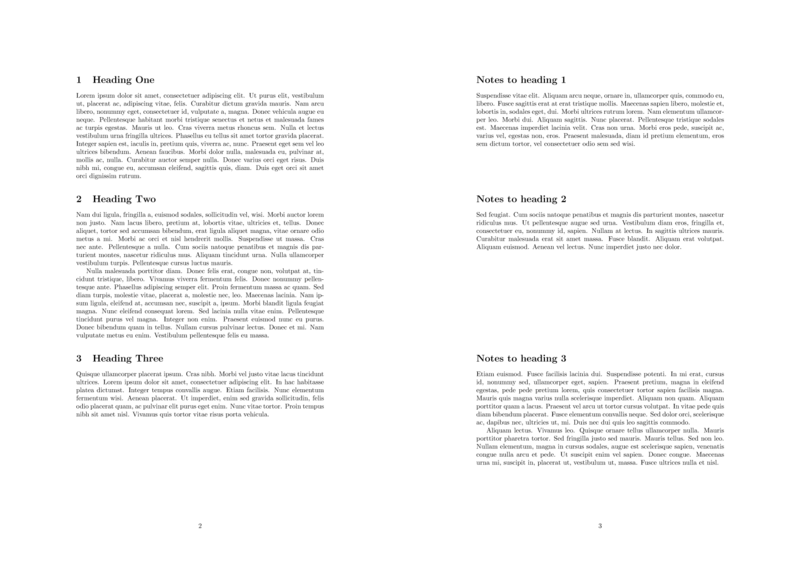 Then the number of A3 pages is manually inserted in the second one (there is surely a way to automatize this). Then one runs pdftex on the second one. 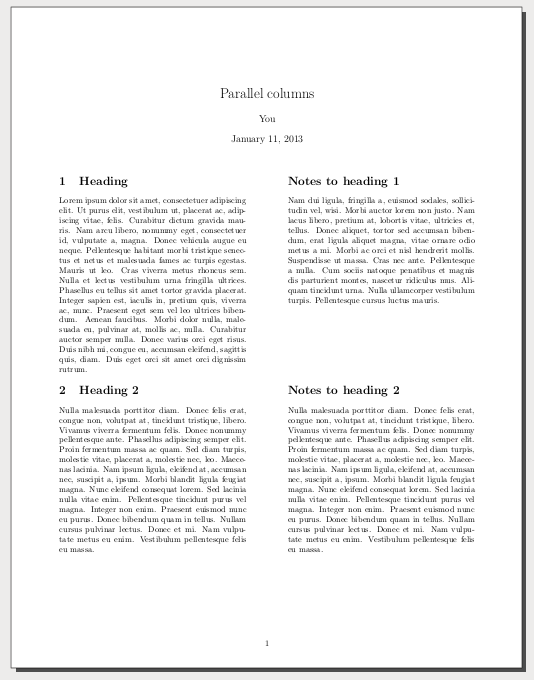 This produces an A4 document with a title page and then the desired layout. Not the answer you're looking for? Browse other questions tagged vertical-alignment parallel or ask your own question. How to use the Parallel package with proper environment options? 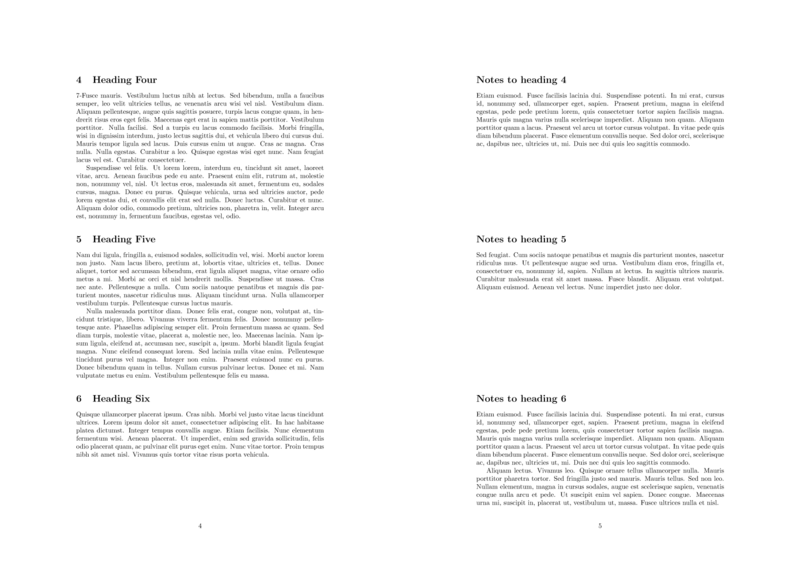 How can I typeset parallel lists of paragraphs on facing pages? Parallel texts with header on each page? Is it possible to set the absolute position of paragraph numbering?